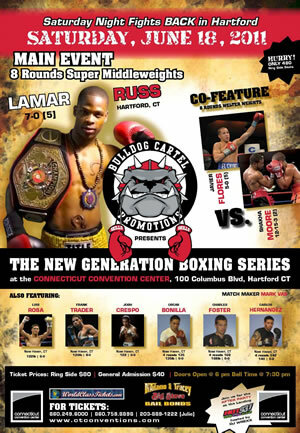 HARTFORD – Bulldog Cartel Promotions launches its “The New Generation Boxing Series” Saturday night, June 18 at the Connecticut Convention Center in Hartford. The eight-round main event features a pair of dangerous cruiserweights sporting deceiving records, Joshua “Juice” Harris (7-4-1, 5 KOs) and Harvey “Candy Man” Jolly (11-17-1, 6 KOs). Harris, of Providence, registered a shocking first-round knockout of Alexis Mejias (10-1) two years ago, while Jolly did the same thing against previously undefeated Nicholas Iannuzzi (12-0), who recently lost a controversial decision to budding star Lateef Kayode. The eight-round co-feature is an interesting match-up between a talented prospect, undefeated Hartford welterweight Javier “El Chino” Flores (5-0, 5 KOs), against 35-year-old veteran Shaka Moore (11-15-3, 2 KOs). Puerto Rica-native Flores is coming off of a sensational second-round knockout of Marcus Hall this past February. Moore, of Norwalk, won a four-round bout by technical decision versus Noel Garcia in April at the Connecticut Convention Center. Another hot prospect, super middleweight Lamar Russ (7-0, 5 KOs) puts his perfect record on the line against TBA. Russ, now fighting out of Hartford, upset Haitian Olympian Elie Augustama by six-round decision in December. Promising junior featherweight Luis Rosa, Jr. (6-0, 5 KOs), representing New Haven, meets TBA in a six-rounder. Also fighting on the undercard in four-round bouts are New Haven junior welterweight Carlos Hernandez (0-2) against Springfield’s (MA) Barrington Douse (0-1), along with three New Haven boxers making their pro debuts – lightweight Oscar Bonilla vs. TBA, junior featherweight Josh Crespo vs. Frankie Garriga and super middleweight Charles Foster vs. Lee Snow. Garriga and Snow will also be making their pro debuts.